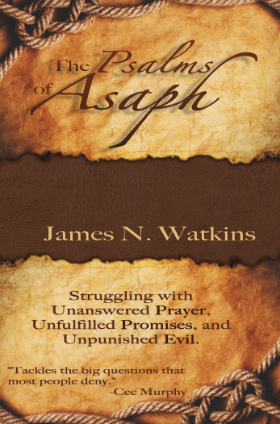 The Psalms of Asaph: Struggling with Unanswered Prayer . . .
You’re not alone if you’re struggling! The psalmist, Asaph, (Psalms 50, 73-83) watched the glorious rise Israel and the building of the magnificent Temple as well as the moral collapse and complete destruction of Jerusalem and the Temple. His writing is filled with raw, honest anguish as he struggled with unanswered prayer, unfulfilled promises, and unpunished evil. James Watkins tackles the big questions that most people ignore—or deny. I felt his heart in this book and thought, I know those feelings. I especially appreciate his writing about this and hope many will read this book. This book is for everyone who’s ever questioned God’s goodness, love, or faithfulness. With his trademark wit and wisdom, James Watkins addresses the hard questions, validates our pain, and offers a shoulder to cry on. This book shines a light on the blackest spaces of our lives and finds the hope that hides in the dark. The Psalms of Asaph is an amazing book that takes a fresh and intimate approach to the great “un’s” of life. Through testimonies and biblical references, Watkins shows how to live in the light of God’s love—despite tragedies, our lack of understanding, and resulting anger. They don’t have to destroy our relationship with him. 1. Is Unanswered Prayer God’s Fault? 2. Is Unanswered Prayer Someone Else’s Fault? 3. Is Unanswered Prayer My Fault? 4. Are God’s “Promises” Really Promises? 5. Are the Promises Conditional? 6. Are the Promises To Be Fulfilled in the Future? 7. Is God Responsible for Evil? 8. Why Doesn’t God Seem to Prevent Evil? 9. Why Is God Slow in Bringing Judgment? A three-year-old’s favorite word is why. Why didn’t God heal my friend? Why do I still have acne at 60? But like the popular game show, Jeopardy, the answers are often in the form of a question. And we know that in all things God works for the good of those who love him, who have been called according to his purpose (NIV). For instance, our group health insurance had very few maternity benefits, but had great “major medical” coverage. At the birth of our first child, my wife had complications and spent five days in Intensive Care. But, because the birth was now “major medical,” every penny of our daughter’s birth was covered. Sitting in ICU for five days waiting to know if my wife was going live or die was not good, but it did work for good.
. . . to be conformed to the likeness of his Son. . . .
And the Lord—who is the Spirit—makes us more and more like him as we are changed into his glorious image (2 Corinthians 3:18b, author’s emphasis). Jesus promises . . .
“Remain in me, as I also remain in you. No branch can bear fruit by itself; it must remain in the vine. Neither can you bear fruit unless you remain in me. “I am the vine; you are the branches. If you remain in me and I in you, you will bear much fruit” (John 15:1, 4-5 NLT). Our spiritual lives depend on this intimate connection with Christ. His life flows into and through us causing us to become organically one with his character. That connection is strengthened through prayer, Bible study, and fellowship with other believers. And suffering! We are pressed on every side by troubles, but we are not crushed. We are perplexed, but not driven to despair. We are hunted down, but never abandoned by God. We get knocked down, but we are not destroyed. Through suffering, our bodies continue to share in the death of Jesus so that the life of Jesus may also be seen in our bodies (2 Corinthians 4:8-10 NLT, author’s emphasis). When I think back to my “successful” years—award-winning author and editor, world-traveling conference speaker, denominational executive, and co-pastor of a growing church—I certainly didn’t resemble the Christ I was trying to follow. It has only been during my “failure” years—years between book contracts, estranged relationships, being voted out of a church, and having to borrow money to make a living writing and speaking—that I have come to derive my self-identity and self-worth from simply being a loved child of God. Praise be to the God and Father of our Lord Jesus Christ, the Father of compassion and the God of all comfort, who comforts us in all our troubles, so that we can comfort those in any trouble with the comfort we ourselves have received from God. For just as the sufferings of Christ flow over into our lives, so also through Christ our comfort overflows. If we are distressed, it is for your comfort and salvation; if we are comforted, it is for your comfort, which produces in you patient endurance of the same sufferings we suffer (NLT). I now believe that God is more than willing to answer those questions and how they relate to living a life conformed to the image of His Son. Even why I still suffer from acne! Thanks for sharing this on your social networks. God is good all the time; all the time God is good. Can’t wait for the rest of the story. Just your prolog blessed my socks off. Thank you and God bless. All the time! Thanks for your encouragement. I’m making good progress on it, so hopefully it will be out in time for the Christmas buying season! Good preface to what will be a soul-searching, thought-provoking book. Well done. Looking forward to more. I’m sure you will proofread, but my English teacher eye spied a couple of things. I do not have a website to list, but would like to have one. Any suggestions for help with that? Thank you for writing from the heart. For sharing real life journal entries-yours. My own read like that in years past. They might have read with less hope earlier this week, but I was feeling too ill and tired of life to journal. Thank you for being God’s man … can’t wait until you finish the book. I want to share it. Jim, this is great stuff! I can give you lots of praise that the material deserves or offer some editorial comments. I certainly want.to purchase your book when it comes out. I will recommend that one of our Sunday school classes uses it! God bless. Thanks, Mary Lee. Yes, this is a rough draft, so please excuse the typos. It should be out Fall 2017. I can hardly wait to read the entire book and share it with women I mentor. Today I met with a young woman who has chosen to run to the Savior for answers in her marriage. Your book is a tool she can use to answer the questions she has as a new believer. Thanks for putting in the hard work so that others will turn to Jesus. Thanks, DeeDee! It was a labor of love . . . but it was laborious.